Kit includes: ic led fixture adjustable docking legs 12vdc ul approved power supply loop ic light and pump controller. With ir remote loop light hub controller hub mounting clips and complete instructions.. . . .
Each Kit includes: 1 Satellite LED fixture 2 adjustable docking mounts 1 12V DC UL transformer and 1 wired LED remote contr. 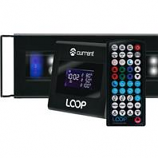 Features independent control of the white and blue LEDs allowing users to select a color mode. Features effects that mimic real-world aquatic conditions. 48 White/18 Blue LEDs. . 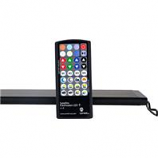 Kit includes: 1 Satellite LED fixture 2 adjustable docking mounts 1 12V DC UL transformer and 1 wired LED remote control. Features independent control of the white and blue LEDs allowing users to select a color mode.. Features effects that mimic real-world aquatic conditions. 66 White/24 Blue LEDs. . Kit includes: 1 satellite led fixture 2 adjustable docking mounts 1 12v dc ul transformer and 1 wired led remote control.. 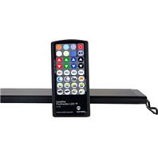 Features independent control of the white and blue leds allowing users to select a color mode.. Features effects that mimic real-world aquatic conditions. 132 white/48 blue leds. . Kit includes: 1 satellite led+ fixture 2 adjustable docking mounts 1 12v dc ul transformer and 1 wireless remote control.. Features include: 6 freshwater-optimized color pre-sets 12. Sliding docking legs allow quick and easy adjustments for a wide variety of installations.. 48 white/24 rgb leds. Dynamic effects: cloud cover fading lunar storm lightning dusk and more 4 memory buttons for saving custom colors. 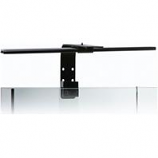 Includes: adjustable aluminum arm fixture mounting clips (2) adjustable tank mount bracket mounting hardware. Aluminum and molded plastic construction. Vertically adjustable. Fits both rimless and framed aquariums. Allows fixture to slide front to back. Kit includes: 1 satellite led fixture 2 adjustable docking mounts 1 12v dc ul transformer and 1 wired led remote control.. 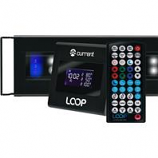 Features independent control of the white and blue leds allowing users to select a color mode.. Features effects that mimic real-world aquatic conditions. 99 white/36 blue leds. . Kit includes: 1 satellite led+ fixture 2 adjustable docking mounts 1 12v dc ul transformer and 1 wireless remote control.. Features include: 6 freshwater-optimized color pre-sets 12. Dynamic effects: cloud cover fading lunar storm lightning dusk and more 4 memory buttons for saving custom colors. Sliding docking legs allow quick and easy adjustments for a wide variety of installations.. 36 white/18 rgb leds. Kit includes: 1 satellite led+ fixture 2 adjustable docking mounts 1 12v dc ul transformer and 1 wireless remote control.. Features include: 6 freshwater-optimized color pre-sets 12. Sliding docking legs allow quick and easy adjustments for a wide variety of installations.. 96 white/48 rgb leds. Dynamic effects: cloud cover fading lunar storm lightning dusk and more 4 memory buttons for saving custom colors. Kit includes: 1 satellite led+ fixture 2 adjustable docking mounts 1 12v dc ul transformer and 1 wireless remote control.. Features include: 6 freshwater-optimized color pre-sets 12. 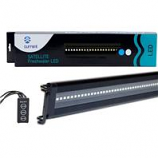 Sliding docking legs allow quick and easy adjustments for a wide variety of installations.. 72 white/36 rgb leds. Dynamic effects: cloud cover fading lunar storm lightning dusk and more 4 memory buttons for saving custom colors. 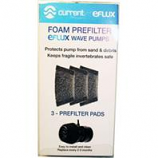 Includes: eflux accessory wave pump magnetic swivel bracket 24vdc ul transformer pump prefilter foam cable protector. For use in up to 75 gal aquariums. . . .
Includes: eflux accessory wave pump magnetic swivel bracket 24vdc ul transformer pump prefilter foam cable protector. For use in up to 125 gal. 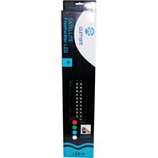 aquariums. . . .
Includes: eflux accessory wave pump magnetic swivel bracket 24vdc ul transformer pump prefilter foam cable protector. 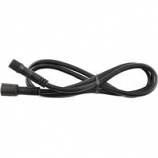 For use in up to 55 gal aquariums. . . .
Includes: flow pump with mounting brackets molded prefilter assembly barbed inlet/outlet fittings micro usb cable. Loop pump hub manifold with flow dial control ul approved 24vdc transformer and instructions. Up to 65% in energy savings and a quiet operation. Loop compatible. 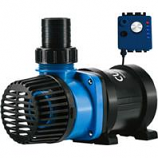 Ic electronic detection protects pump if no water is present. Includes: eFlux DC Flow Pump DC Flow Pump Controller HUB 24V DC UL transformer Controller HUB Mounting Bracket microUSB C. Quiet operation. Up to 65% in energy savings. 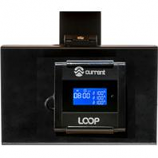 LOOP® compatible. IC electronic detection protects pump if no water is present. Each kit includes: eflux wave pump magnetic swivel bracket 24v dc ul transformer eflux led pump display eflux wave pump. Wireless ir remote provides an effortless way to program up to 3 eflux wave pumps. Use a magnetic bracket which is easy to install and allows you to position the pump virtually anywhere in your aquarium. 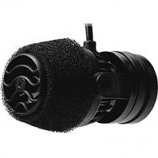 A silicone pad absorbs vibration allowing the pumps to run virtually silent.. Up to 75 gal size aquarium. Each kit includes: eflux wave pump magnetic swivel bracket 24v dc ul transformer eflux led pump display eflux wave pump. Wireless ir remote provides an effortless way to program up to 3 eflux wave pumps. Use a magnetic bracket which is easy to install and allows you to position the pump virtually anywhere in your aquarium. A silicone pad absorbs vibration allowing the pumps to run virtually silent.. Up to 125 gal size aquarium. Each kit includes: eflux wave pump magnetic swivel bracket 24v dc ul transformer eflux led pump display eflux wave pump. 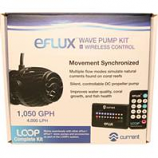 Wireless ir remote provides an effortless way to program up to 3 eflux wave pumps. Use a magnetic bracket which is easy to install and allows you to position the pump virtually anywhere in your aquarium. A silicone pad absorbs vibration allowing the pumps to run virtually silent.. Up to 55 gal size aquarium. Includes: controller & hub mounting plate with hinge aluminum mounting bracket mounting hardware velcro cable straps. Protects controller hubs and cables. Adjustable hinge for the perfect viewing angle. Mounts inside virtually any aquarium stand. Multiple mounting positions. 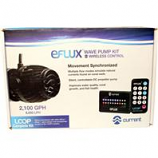 Compatible with orbit ic led aquarium lights eflux wave pumps and eflux dc flow pumps. Measures 9ft. . . .